Another oddball ellipse topic: Let’s suppose you have two unit circles (r=1) adjacent, i.e. tangent, to one another, and you want to draw an ellipse that contains them. But not just any ellipse. The smallest such ellipse. 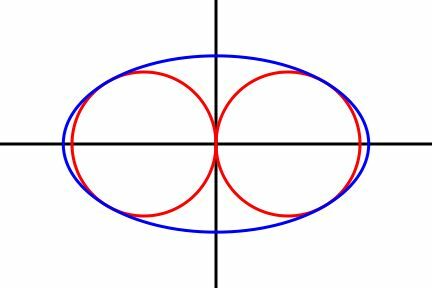 Establish a coordinate system: The two circles’ centers are at (–1,0) and (1,0); they touch at the origin. One circle extends from the origin to x=2 on the x axis, the other from the origin to x=–2. This is symmetric under reflection in the x and y axes, so the ellipse will be too: its semimajor and semiminor axes will be on the x and y axes (not necessarily respectively). It’s not “tilted” in other words. And by symmetry, the smallest ellipse containing one of the circles will also contain the other, so we can ignore the circle at (–1,0) and just work with the one at (1,0). The red unit circle intersects the blue ellipse at four points, the purple ellipse at three, the green ellipse at two, the orange ellipse at one, and the brown ellipse at none. Except when it is at (2, 0) each intersection point occurs as one of a pair at the same x — one at positive y and one at negative y. So there are 0, 1, or 2 distinct x values for the intersection points. In this drawing the orange and brown ellipses are the only two that contain the entire circle. So what’s the smallest such ellipse containing the entire circle? Obviously that ellipse must not cross the circle, but must be tangent to the circle from the outside. At least I think that’s obvious! If you imagine you have a video display, with two knobs that control the semimajor axis a and semiminor axis b, then you can think of two ways to achieve tangency. First: Start with a tall, narrow ellipse, one with large b and small a; it intersects the circle at two points with the same x (like the green ellipse above). Now start turning up the a knob. 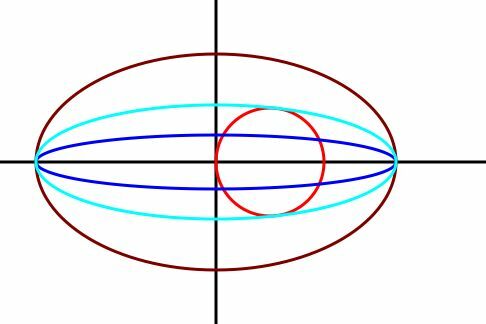 The ellipse gets wider, the intersection points move to the right, and once they’re past x=1 they start getting closer and closer to one another. When a=2 they coalesce to a tangent point at (2, 0) (like the orange ellipse, which intersects only at the tangent point, or the purple one, which has an additional pair of intersections). In the first case we have a single solution for x (in real numbers, 0<x≤2) and we drive it toward x=2 by adjusting a to 2. In the second case we have two solutions for x and we drive them together by adjusting b. Now let’s do the math. and when you work that out you find one value of x always is 2. But for b > √2, the second value of x is > 2 which is not a valid solution. (In real numbers. That is, x is still real, but y becomes imaginary.) 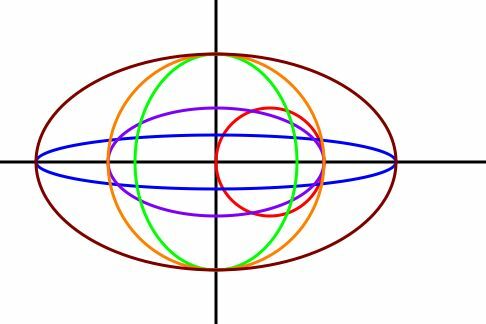 So there is only one intersection, at the tangent point, and the circle is entirely contained in the ellipse. On the other hand, for b < √2, the second value of x is < 2 which means there’s another pair of intersections; this is the purple ellipse above. So the ellipse is tangent to the circle but doesn’t contain the circle. Now, which ellipses containing the circle have the smallest area and perimeter? We need the ellipse to be tangent to the circle but not to cross it, which means we exclude the high eccentricity a = 2 case (b < √2). which is smaller than for the other case, so it’s the winner. * Oh, by the way, did you know if you Google “ellipse perimeter” you get an ellipse perimeter calculator using one of Ramanujan’s approximations?